At the conclusion of the 2014 S15 season I posted an article title “Where To Now Super Rugby” in which I set out some of my concerns regarding the future of Super Rugby. Where To Now Super Rugby? The SA Rugby Referee's Society held it's annual Pat-Ourselves-On-The-Back Awards ceremony recently. 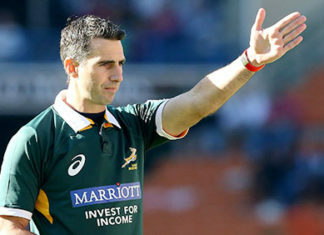 Chairman of the SA Rugby Referees' Society, Steve Meintjes, made presentations to members who had achieved exceptionally. have often wondered about the current trend or system of referees constantly chatting to the players during a game of rugby. Watching the video of Dylan Hartley being red carded in the Premiership final for verbal abuse of the ref brought it back to the front burner in my somewhat cluttered mind. Seventeen consecutive days of Olympic Games have passed, finally, into history. Athletes have returned home to their adoring fans and huge numbers of opportunistic politicians jumping aboard the Olympic Express to gain some reflected glory from the successes of the athletes. Where to now for Super Rugby?